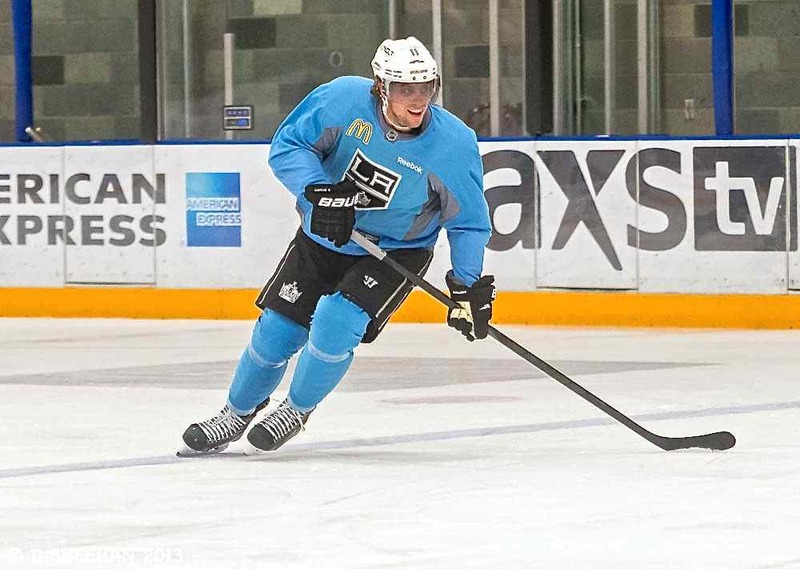 LA Kings center Anze Kopitar, shown here during a recent practice. EL SEGUNDO, CA — With the Los Angeles Kings beginning a four-game road trip in Nashville tonight (5:00 PM PST, televised on Fox Sports West in Southern California), and with the news that goaltender Jonathan Quick is on the trip, and is practicing with the team, it appears that he is now within a week or two of returning to the lineup. 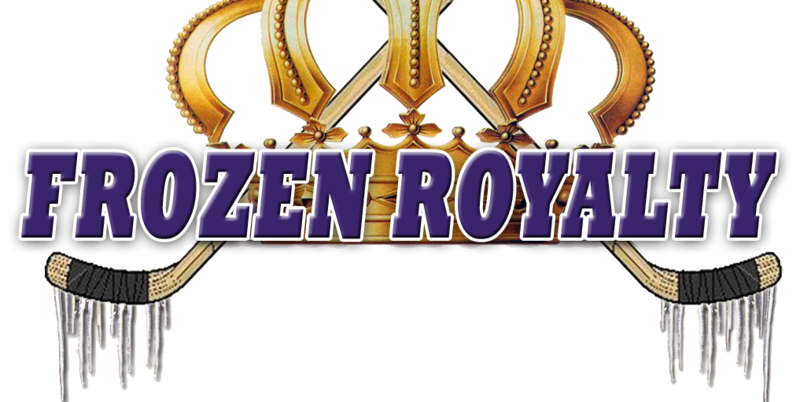 When he went down with a grade 2 groin strain—a partial tear—on November 12 at Buffalo, a collective groan could be heard rumbling through Kings Nation. Many expected that the team would struggle to keep their heads above water without their star netminder. Some even thought the Kings would plummet in the standings. Instead, the Kings have gone on a tear, earning a 14-3-3 record (.775 points percentage) since Quick was injured. Much of that has been the result of outstanding goaltending provided by backup goaltenders Ben Scrivens, and most recently, rookie Martin Jones. Their feats have received ample media coverage. But their outstanding play has made it easy to overlook the fact that it takes a lot more than great goaltending to win games. One reason the Kings have enjoyed such great success lately is that they have been getting contributions from players who were not getting their names on the scoresheet much last season, such as Dwight King, Jordan Nolan, and Jarret Stoll, not to mention rookie right wing Tyler Toffoli. Although the Kings remain in the middle of the pack offensively, when you combine the fact that they are getting contributions from unexpected sources, along with stellar goaltending and solid defensive play—the Kings are atop the league rankings on defense—what you get is a winning formula. “A lot of it is that we’re finding different ways to win, whether it’s a 1-0 shutout in New York, or even if we’re not playing well, good teams find ways to win,” Brown noted. As Brown indicated, the Kings got off to a slow start, earning a 5-4-1 record through November 12, when Quick went down. Contributions from throughout the lineup. A hard, heavy forecheck. Solid defense. Outstanding goaltending. Timely goals. If all those things sound familiar, they should. That was the formula the Kings concocted during the 2012 Stanley Cup Playoffs, resulting in a 16-4 post-season run to the first Stanley Cup Championship in what was then the 45-year history of the franchise. The Kings’ play over their last 19 games has closely resembled that of that remarkable playoff run. Just don’t try making that comparison when Kings’ players are within earshot. Speaking of doing a pretty good job, although he is not lighting up the NHL with gobs and gobs of goals, Kopitar is scoring timely goals, and is averaging 0.82 points per game to this point in the season. As of this writing, Kopitar is on pace to score 24 goals this season—not a bad number, but not one that matches his talent level. Even though Kopitar has acknowledged that he was told after last season that he needed to shoot the puck more, once he is on the ice, his instincts take over. “It’s pure instinct out there, because it’s pretty fast,” he added. Although Kopitar could certainly improve in the goal scoring category, he is producing with new line mates, Jeff Carter and King, and is the Kings’ leading scorer. But what often goes unnoticed is that he has become one of the NHL’s best defensive forwards, if not the best in the league—he is a big reason why the Kings are the top-ranked team on defense in the NHL. Kopitar’s outstanding +20 plus/minus rating is indicative of his often dominating defensive play. But playing on the West Coast means that his exposure in most of Canada and in NHL cities east of the Rocky Mountains is limited, and that is putting it rather generously. As such, even though he should at least be a finalist for the Frank J. Selke Trophy, awarded annually to the league’s top defensive forward, it is more likely that he will finish out of the running once again, as he has the past two seasons. Would Kopitar like to win the Selke Trophy, recognizing his defensive efforts?